I was once told by a great chef that there are as many recipes for Charoset as there are Jews in the world. I never truly understood that saying until I was a guest at a Seder where 2 sisters, both in their 70’s started discussing their grandmother’s recipe. They were similar, yet, not quite the same. Neither had it written down, yet both thought that their version was the “one” they remember from their childhood. Charoset is one of the Pesach dishes that showcase the vastness of the Diaspora on Jewish culinary traditions. As people moved and settled into different geographic and ethnic areas they incorporated local ingredients. Ashkenazic Jews used apples as their base. 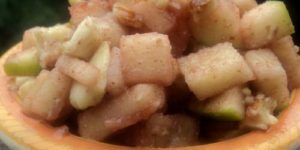 Sephardic Jews from the Mediterranean and other countries in the Middle East opted to make Charoset with dates, figs, and other dried fruits. Although most American Jews favor a mixture of apples, almonds, cinnamon and wine this is by no means the only combination possible. Walnuts, pine nuts, pecans or even chestnuts may be combined with apricots, coconuts, raisins, dates, figs, or even bananas (ok, bananas are a little weird but I have actually tasted Charoset with bananas and it wasn’t that bad). 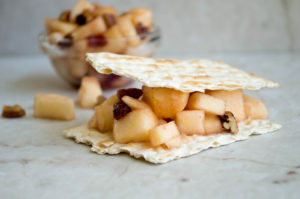 Traditionally, Charoset is eaten just during the Seders. However, in my house, if there isn’t leftover, I have to make another batch because everyone love to eat it as a snack or side dish long after all the guests have gone. A touch of coconut lends this Charoset exotic flavor, and its chunky texture makes it a good accompaniment to roast chicken and carrots. In a bowl combine the sugar, zest, juice, and apples. Stir in the almonds and coconut. Cover and refrigerate for at least 2 hours. Makes 4 cups. This recipe can be doubled or tripled. In a bowl combine the apples, cranberries, wine and maple syrup. After the mixture is thoroughly combined stir in the nuts. Cover and refrigerate for at least 2 hours. Makes 3 cups. This recipe can be doubled or tripled. In a bowl combine the apple, pear, lemon juice, vanilla and honey. Mix to combine. Fold in chopped pecans and cover and refrigerate for at least 2 hours in an airtight container. Makes 2 1/2 cups. This recipe can be doubled or tripled. This is a wonderful website and I thank you very much for all the new, to me, recipes to be found here.